With many schools moving toward a ‘wrapper-free’ lunch box the challenge for parents is to find a box with the right number of compartments. How hard can it be? Well, it is. I know some kids who find a sandwich, an apple and a biscuit is what they need to get them through the day. In contrast, my hungry boys rip though a sandwich, a yogurt, at least one piece of fruit, some crackers and a drink. With four lunch boxes to fill every day, it’s no wonder I get sidetracked by ‘lunch box innovations’. 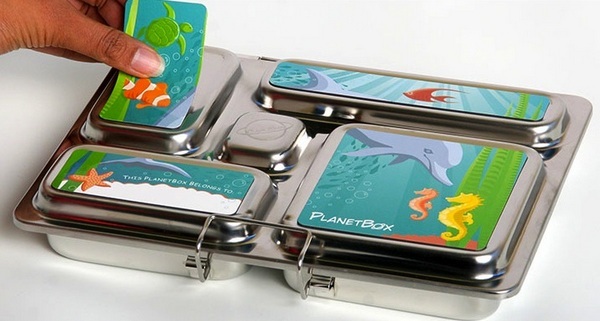 PlanetBox makes really groovy stainless steel lunch boxes that are divided into five generous sections. The design was inspired by the Japanese Bento box but adapted to cater to Western lunches – sandwiches and rolls, fruit, yogurt and so on. Each box comes with a set of magnets for decoration (although I must admit I like the sleek, plain look). And if you need some lunch box inspiration, I reckon some of the pictures below look scrumptious. Also available are ‘dipper’ containers for wet and potentially messy foods such as yogurt and dips, extra sets of magnets to change the look of your PlanetBox and a cool bag to keep your lunch chilled. A basic PlanetBox lunch box is US$34.95 and a full set, which includes the dipper containers and a cool bag is US$59.95. PlanetBox ship to Australia (although know in advance that the shipping rate is a hefty US$44! ).